This month you can receive FREE Editing ($240 value) when you start publishing today! 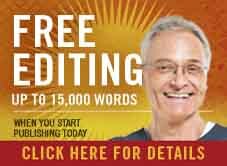 This month, enjoy our high-quality, basic copyediting service for FREE for manuscripts up to 15,000 words and a pro-rated discount of $240 can be applied to the service for works of greater length. START TODAY by entering the promotion code FreeEdit2015 when checking out of your shopping cart while purchasing the popular Diamond package or the full color Pearl publishing package by November 30, 2015.